Research now, rewards come later! The purpose of this article is to show how to track keyword competition and search volumes using Google's Adwords Keyword Tool. If you run an online website, from time to time you will be asked to release new pages or products for your visitors. As a web page editor/SEOer, you will want those pages to rank in organic search, as high as possible with very little initial back linking work to them. You also want to find a term that people are searching for too. It’s no good optimising your page for a term that gets less than 10 local searches a month. This means looking for keywords to target the page with the least amount of competition as possible but with a good balance of searches. So how are you going to do this? Well the Google Adword Keyword tool will be instrumental in doing this. To start looking at how competitive certain keywords and keywords phrases are, follow the steps below. Type a keyword into the Word or phrase box, fill in the anti spam box and click on Search. 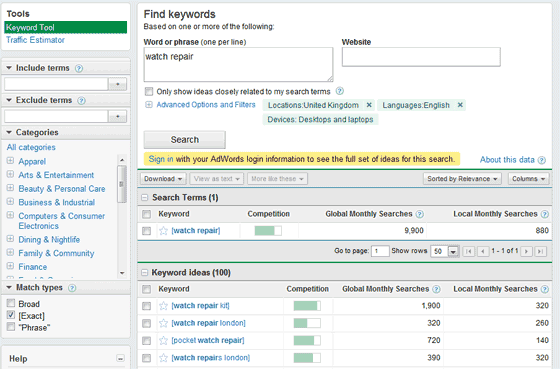 After a few seconds you will see your keyword, the competition for it as well as the global and local search volumes. To get a more exact match for your keyword term, look for the “Match types” option on the left and put a tick in the [Exact] box, and take the tick out of Broad. Click on Search again now and watch those figures drop like a stock market crash! I’m using the keywords [watch repair] as an example of Exact & Broad matches above and below. If you’re thinking of going multinational, then you may need to check out the competition for keywords and search volumes in different countries, this is easily done by following the steps below. Above the Search button, click on Advanced Options and Filters. In Locations and languages, specify the country which you are looking at targeting and click on the Search button again. The figures below will update again for that specific country. If you are lacking imagination and need a hand working out new permutations of keywords then look at the keywords ideas section below your initial search term. You should see a fair few ideas there. If you find this screen hard to read then you can download the data. To do this, follow the steps below. Click the Download button above your search term. Select CSV for Excel and click on the Download button. Save the file to a memorable place. That’s it. Your data is now downloaded ready to import into a spreadsheet for you to analyse. If you have other data regarding these keywords like a potential traffic estimate and possible orders then you can tie all this in too. You might want to use a relational database like Microsoft Access to do this though, to make things easier to manage. What you can also do in the Google Adwords tool is use the Traffic Estimator option on the left to specify your keyword’s maximum cost per click (CPC) and daily budget. Fill in those 3 boxes with your details and click on the Estimate button. The average cost per click. Total estimated clicks to your website. And, total estimated cost per day. When starting out with Adwords, you need to be careful than you don’t spend more than you’re making, unless that’s your plan for the first few weeks, just to get noticed.